These are wonderful! I must do this with my girls, they have been asking me the same thing. Very cute quilts John! Oh and children too!! My boy (6) is way more interested in quilting than my daughter (8) I might just send him your way!! They are adorable!! Both the kids and the quilts. I just love the whole evolution of how they made these! Fantastic that you have some budding quilters, or at the very least quilt lovers!! oh that is too cute! and how nice that they had some creative time with Dad too. I can't remember making anything with my mum when I was a kid - although I'm sure I did - I'm just getting older and forgetting more stuff! Wonderful and so inspiring! My boys (6 and 8) have been wanting to make their one pillows recently, but I will show them this and see if they would rather try a mini quilt. So cute -- thanks! How lovely is it that you can share your passion with your children? My oldest desperately wanted a sewing machine for her 3rd birthday this past December and was insulted when I suggested a toy. So she has a little Sew D-lite (with the power cord and needle removed) and she ‘quilts’ with me all the time. Maybe one day we will actually be able to make something together! What great quilts and I love how each of the children picked out their own blocks. I miss not having little ones around to teach and encourage. Beautiful children! What a great project. There is so much I like about it: that you involved your kids (or they involved you) in the project, that they got to do as much or as little as they wanted; that you quilted them in different fashions; and that you shared it! Have a great day! How wonderful! I feel your pain on the 6 year-old insistence. My son is the same way. Neither he nor his brother, however, are the least bit interested in quilting. They are constantly putting in requests for quilts, but have no desire for the process. You're a lucky man! 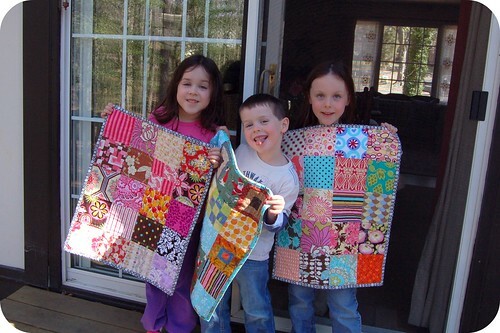 It's so great that your kids want to get in on the act :) What a wonderful memory for all of you and maybe the beginning of some new quilters in the family! Your darling children look so pleased with their superb quilts. You go, Quilt Dad! This is a great blog entry. How wonderful that you were able to teach them how to do this and spend some quality time doing something you love. I bet they will not forget that day! Best kind of memories to make! Oh, so very cute!!! Loved reading your post about the whole process!! Enjoy! These are so fabulous! I have many fond memories of getting involved in whatever crafting/making projects my father had going on, and even made a hand-pieced hexagon potholder for my grandmother that was inspired the hexagon quilt he was making at the time. What a great dad you are! Very very nice. And theres hope for Bevin too. My oldest daughter expressed an interest in things quilty several times over the years but never had the patience to see any project through to the end. She lost interest quickly. I bought her a sewing machine for Christmas in 2009 and she's made purses and pillows and has the fabric cut out for a quilt of her own making - pattern and all. You're a great dad for helping them with the whole thing and letting them do the parts they wanted to actually do. What fun! Get 'em hooked early! Your kids are darling. What great projects to share with them. Completely adorable: the quilts and the kids. I used to have a pair of socks like Bevin's, decades ago, but had to get much older before I making my own quilt(s). That's precious! Seriously adorable- what a fun project for them. Awesome. Really cute. My oldest grandson is 2 1/2 and I have a brand new granddaughter. I can't wait to introduce them to the sewing machine. It will be awhile. I will enjoy what your kids sew for now! BTW, the kids are adorable. I love the purple pants and striped socks. Aren't kids just the best. Enjoy them whilst they are loaned to you because that's what it really is and before you know it, going by one day at a time, they are all grown up and gone. Their quilts are all lovely and so are they. Your kids did a fantastic job on these quilts! My Mom allows my daughter and two nieces do the same thing with her scrap pile and they have a blast too! They must have your eye for color and pattern! I love this post! I can't wait to do this with my twins-plus-2 :) My kiddos are ages 5, 2, 2, and 9 months... so I'm going to be waiting a bit! Thanks for sharing their cute smiles and great quilts!!! I love that your kids wanted doll quilts and its so cute that one daughter has an interest in sewing. I loved learning craft projects from my mother and as my patience and abilities grew so did our bonding time in the craft room - such precious memories. Super fun post!!! 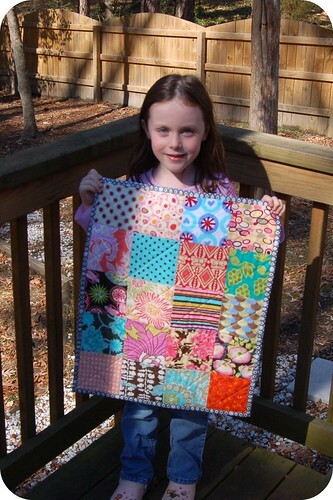 I once gave my daughter (I think she was 9) free reign to pick any fabric from my FQ shelves to make a big 4 patch quilt. I was very proud of myself for letting her choose whatever she wanted (man that was hard, pathetic eh?). It took a couple of years to actually get that quilt finished and she gifted it to her gymnastic coach for her new baby girl. Good on you for getting all 3 doll quilts done over the holidays!! Fantastic to read of you quiloting - great work!!! Also impressed you are taeching your children - how wonderful for them...and what lovely quilts they have. I will pop back and see what else you have been up to soon. So cute! You have wonderful children! They are soooo cute! The kids and the quilts! Monica and I were on the floor laughing over those reindeer and naughty Santa the other night. Those are great, John! And what a fun project do share with your kids. Those are great! Santa 'whipping the reindeer' tee hee... My 4 year old son likes to help me sew and is very inquisitive about my machine and how it works. That is just so cool, to have them want to make their own quilts and what a fine job each of them did in picking out the fabric and colors. They are talented kids!! Do you think I could get my 31-year old son and his wife pick out some fabric and colors so I could make them a quilt? Hmmmmm!! I have hopes of teaching my G-daughter to sew and this gives me more hope. I love the quilts and I am anticipate the future when your Beautiful Megan makes a quilt again. Bevin's (what a beautiful name) quilt and clothes, color choice and style remind me of my Chloe. 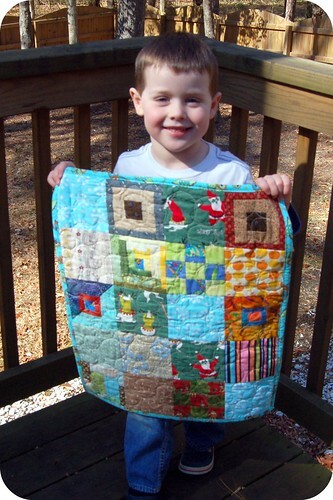 And Sean's choices are great, it is for sure a little boy quilt. What a wonderful thing to do with your children. 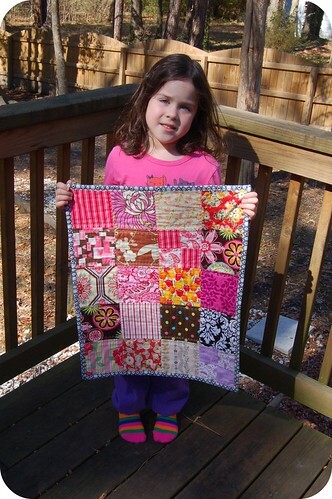 This is adorable (your children and the quilts); lucky kids/lucky Dad! Looks fab! I love the colour choices they made- very nice, and defintely well picked for youngsters! What a fun activity to do with your kids!